AFC Fylde boss Dave Challinor suffered a disappointing return to his former club. Doubles from Richie Sutton and Connor Jennings sealed Fylde’s fate, and although Jonny Smith pulled one back the damage was done to leave Challinor’s side without a win in five games. The Coasters settled into their stride quickly on the Wirral and a clever dummy from leading marksman Danny Rowe inside the area handed Serhat Tasdemir a chance to take aim, though his first-time effort was deflected over the bar. Fylde keeper Jay Lynch had to be on his toes shortly after the 10-minute mark to turn Ollie Norburn’s low drive around the post in an entertaining start to the match. Norburn again went close a moment later, nodding narrowly wide at the near post having been picked out by Adam Buxton. Tranmere full-back Eddie Clarke gifted Fylde a glorious goalscoring opportunity when his wayward header inside his own box landed at the feet of Smith but the winger could only find the goalkeeper’s arms. 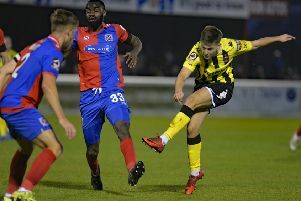 The Coasters were enjoying a decent spell of possession and a delicious cross from Jordan Richards was almost turned home at the back post by Zaine Francis-Angol. The Tranmere backline opened up for 17-year-old winger Tasdemir on the half-hour but his curling effort from 20 yards was well wide of the right post. The deadlock was broken perhaps against the run of play on 37 minutes, when Ollie Banks’ corner was flicked on by James Norwood towards the back post, where Richie Sutton was lurking with space to lash the ball home. The goal kicked Rovers into gear and Norburn looked to add an immediate second, testing Lynch with a wicked long-range strike. However, the second did arrive two minutes before half-time, when Lynch pulled off a fantastic reaction save to again deny Norburn but the ball fell invitingly for defender Sutton to tap in. Fylde responded when Rowe fired goalwards from 12 yards but man of the moment Sutton was again in the right place to clear off the line with the goalkeeper beaten. The second-half was always going to be an uphill struggle for the visitors, Smith and Rowe both blazing over. Tranmere extended their lead eight minutes after the restart, when Andy Cook was allowed to turn on the edge of the area and the ball broke for Connor Jennings to rifle into the bottom corner. It was far from one-way traffic and Scott Davies did fantastically well to tip over Smith’s curling effort. And it was Smith who pulled one back for Fylde on 58 minutes. Richards’ low ball in from the right fell to substitute Jack Muldoon, who laid the ball off for Smith to curl into the bottom corner from 12 yards. There should have been another for the visitors soon after, when McNulty inexplicably headed straight into the path of Smith on the six-yard line but indecision saw the opportunity spurned. Jennings sealed the points for the hosts on 68 minutes, the winger steering a rasping drive into the bottom corner from the edge of the area. Rowe could have reduced the deficit with 15 minutes to go, when he connected beautifully with Lewis Montrose’s cut-back only to see his shot rebound off the bar. The frontman forced a smart save from Davies and then drove a powerful free-kick past the post but it just wasn’t to be Rowe’s or Fylde's day. Tranmere: Davies, Buxton, Sutton, McNulty, Cook (McDonagh 85), Norwood, Jennings, Norburn, Mottley-Henry (Gumbs 81), Clarke, Banks (Hughes 70); Subs not used: Cole, Pilling. AFC Fylde: Lynch, Richards, Tunnicliffe, Edmundson, Grand, Francis-Angol, Montrose, J Taylor (Bond 75), Smith (McCready 75), Tasdemir (Muldoon 58), Rowe. Subs not used: Blinkhorn, Burke.